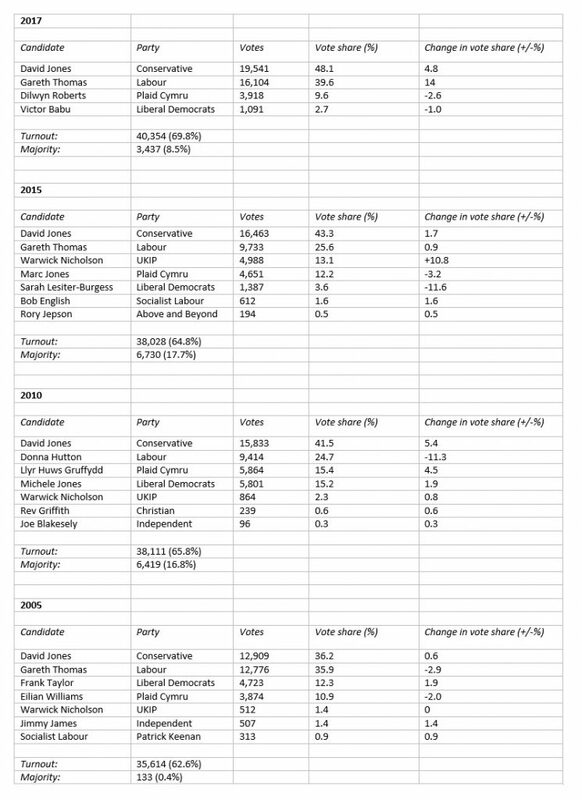 As a Parliamentary constituency, Clwyd West is fairly new; it was created ahead of the 1997 General Election by merging parts of two older constituencies, Clwyd South West and Clwyd North West. Traditionally, the area covered by the new constituency had tended to vote for Conservative candidates. However, a Labour Party candidate, Gareth Thomas, was returned at the 1997 General Election, and he held the seat in the subsequent election in 2001. At the 2005 General Election, David Jones succeeded in winning the seat with a majority of 133. He held the seat at the 2010 General Election, increasing his majority to 6,419. This represented a swing of 8.4% in his favour, which was higher than the national Conservative average for that election. David held the seat for the second time at the 2015 General Election, defeating the Labour Party candidate by a substantial margin. David increased his majority to 6,730, with an increase in the number of votes cast in his favour, and an increased share of the popular vote. In the 2017 General Election, David retained his seat for the fourth time and increased his vote share by almost 5 per cent. Clwyd West is also a Welsh Assembly constituency. It is represented in the Assembly by a Conservative, Darren Millar AM.